The name says it all. A rogue on a chessboard. You are the king of white army. In fact you are sole remaining member of said army. But! You can still win by assassinating the black king after you singlehandedly defeat his soldiers. Not the last starfighter story again … Oh well. 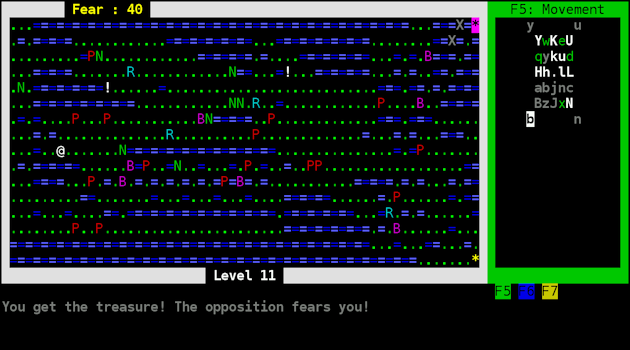 Roguelikes save for few exceptions have never been good in the plot department. This can be forgiven. Chess requires good strategy to win against a competent player. You need to plan carefully and sometimes sacrifice a piece to gain upper hand. ChessRogue is more about tactics. You will often wonder how to get out of a tight situation, what next piece to capture or ask yourself if getting to that treasure out there is worthwhile. Usually looking merely one or two turns ahead is sufficient but later this number increases. With only a single hit point this game leans heavily into puzzle genre. The board is colored with alternating light and dark colors. Helps quite a bit with fighting bishops and making longer diagonal moves in general. There is also SDL mode but it is compiled only for Windows. Linux users need to some nontrivial dependency resolving to compile it first. The looks pass but controls are bit worse. Those of you with disdain for vi-keys will not be pleased. It is here as default control scheme. Sure, you can get around using number pad quite well at the start but later you must make two or three space moves. To do you that need to use the vi equivalent. Despite constantly displaying keys ChessRogue is not good game learn vi style keys because one mistake often means game over. Luckily there is keymap included. On Linux it can be put in home directory or made hidden and it will still be found. Ingame movement display will change to accommodate edits. Unfortunately good news end here. Said keymap states function keys, number pad, return key and other similar key cannot be remapped. Number pad fans are at a loss. People with non-qwerty keyboard layouts will need to edit crkeymap.txt file before playing. ChessRogue creates a board and sprinkles opposing pieces on it. The most variation in gameplay comes from randomized levels. Number and types of opposing pieces differ only slightly between playthroughs. Water layout defines how the battle will fare. You should look for best places to exploit skills you have and at the same time efficiently hinder enemy. On difficulty modes below expert first level will feature a water cross where you can trap pawns without much trouble and get them all. On toughest setting you need employ crowding tactics to pick them off. 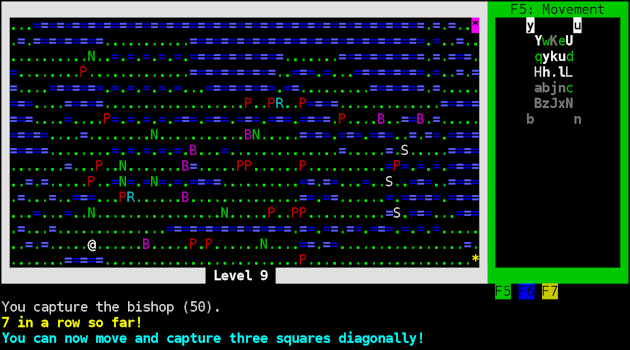 Moreover there might be not enough pawns generated to make diagonal capture ability available. 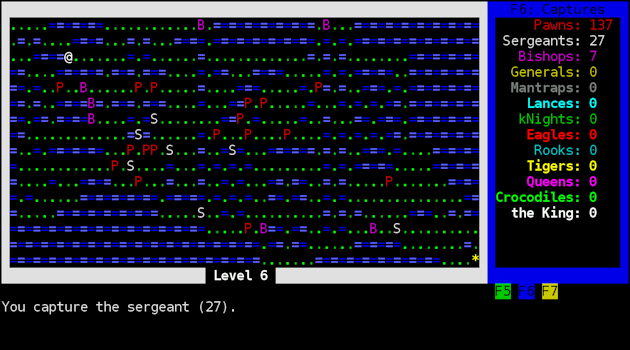 Then on second level you may need to face sergeants with just basic powers. Surviving this requires a bit of luck which is against the spirit of chess. Sometimes ChessRogue will smile at you and place bishops or even knights in a spot where they are unable to make any moves. Another subtle but not without tactical uses rule is order of piece movement. Sometimes while observing enemy movement patterns you might deduce that pawn moves before this bishop does. Such knowledge may allow you to move into seemingly dangerous places because you know that a pawn must move first and only available spot to enter is one cutting off a path of aforementioned bishop thus guaranteeing you safety. This is difficult to pull off but very satisfying if played well. Also if you are in a losing position where every possible escape is covered try to look for places that can be obstructed with lucky piece movement. You might survive more than one ambush. Earlier I have mentioned treasures. These are represented by white exclamation mark and come in three types. Fear effect makes enemy pieces flee from you unless you stupidly wander into a position where you can be immediately captured. Used well this may be helpful in separating tough pieces, splitting dense or well-covered formations or madly dashing to the exit. The last option does not reward you with additional points or moves but in later levels this might be wise decision. After all not much is left to be learned from all those dangerous pieces and you might get captured. Second effect is haste. Speed enables you to make two moves in a turn. Very useful. Finally, learning makes every capture count triple bringing desired new abilities to you faster. On the other hand you receive bonus score for every unexpired treasure when you enter exit. Do not bother with this much before you get your first win though. Currently ChessRogue presents two modes to players. Classic Pieces and no special challenge. Do not let yourself be deceived! Playing with classic chess pieces only makes for easier game because there is less possibilities to consider and fewer levels to get caught. Extra pieces are still present sometimes. They appear with special level entrances and inside those but are not counted in score list. They may still contribute to chain captures though. Overall new piece types make for more interesting play but much less balanced. You will note more than one time the aggressiveness of sergeants. They are by far more dangerous than generals because they cannot move back in orthogonal corridors. If two of them team up or one with a pawn in front be prepared to count that way out. If all your ways get generated with teams like this you know Random Number Generator hates you today. 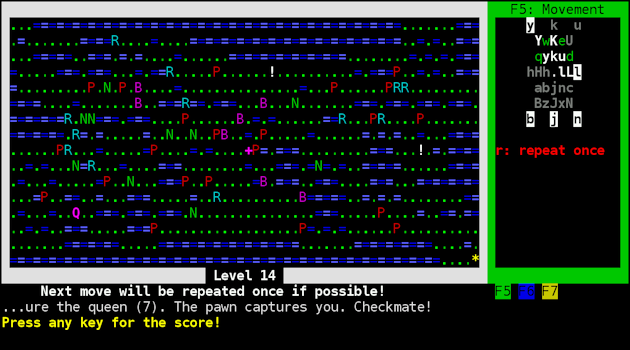 Weak point of ChessRogue are its first levels. There is barely any challenge offered even the first time. Unfortunately patience requirement is significant. Imagine getting captured somewhere in midgame. You brain got used to solving difficult situations with advanced pieces on board and now you are back to fighting just meager pawns. Boredom has great potential to turn your thinking off at this point resulting in getting owned by that brown ‘P’. Quite frustrating. Special predesigned areas are another not so great addition. There you will find prearranged pieces and a boss waiting to be conquered. Exit does not appear until the special opposing piece is captured or (at the fortress) zoo wall is smashed. The problem is the special level is the same every time. Once you figure a strategy (or a few) for solving that puzzle it becomes more like a boring chore to overcome. You need just to make no mistake executing the plan. A plan, which is very similar every time. To add insult to injury capturing cannoneer (boss of second predefined area) while in classic piece mode is useless because there will be almost no sergeants available to load the gun. ChessRogue presents very entertaining challenge. It is worth recommending it especially to masterminds. In late game with plethora of moves to make try to make the longest chain capture possible. My personal best is 27 pieces taken in a row. The joy is overshadowed by low replayability of early game, poor quality user interface and somewhat by game saving possible only between levels. no link to the game? Whole header was missing. Fixed.